Key West fishing charters are the solution if you're after the ultimate Key West fish, and want to experience an unbelievable thrill. This is the world of deep blue, where Key West fish are fighters and the adrenalin rush kicks into overdrive. Nothing compares to the excitement you'll feel when a sailfish or marlin hits the end of your line. Your tension will mount, and when the big fish breaks the water's surface and unfurls it's sail, it'll be heart in the throat non-stop action. This explosive dance is in fact a union of fish and fisherman. The combined frenetic energy of the fish desperately jumping over and around the boat, mixed with the fisherman's deafening screams and hollers, results in an experience that's totally exhilarating. This isn't story telling. This is every day reality, at least it is when you're a Key West fishing charter. The ability to adapt their fishing knowledge to their clients needs, is what makes a good Key West fishing charter captain. Over and above passenger safety, the primary goal is to ensure everyone has as much fun and gets as much action as possible. You also can plan your fishing charter based on time. It's a proven fact that you can catch the same Key West fish on a 4 hour trip as you can on an 8 hour expedition. The only difference are the odds. If you're lucky, and the fish are hitting, you'll catch as many on a half day, as you would on a full day of Keys fishing. Fishing charters also provide everything you need for the fishing trip. The only "extras" you're responsible for are your beverages, snacks, sunscreen, sunglasses, camera and hats. When inshore fishing, typically your Captain will anchor up, and put chum in the water to chum the fish to you. Depending on the time of year, you'll catch amberjack, mutton snapper, grouper, shark, barracuda, mackerel, tarpon, and other popular varieties. No matter where or how long you go, the main objective of your Captain should be to structure the charter fishing trips so you can catch the most Key West fish, and enjoy as much action as possible. 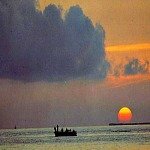 The table below breaks down the Florida Keys fishing charter companies by area. You can click on the image or link for Key West charter fishing and that will take you to a preview page for the different fishing guides. 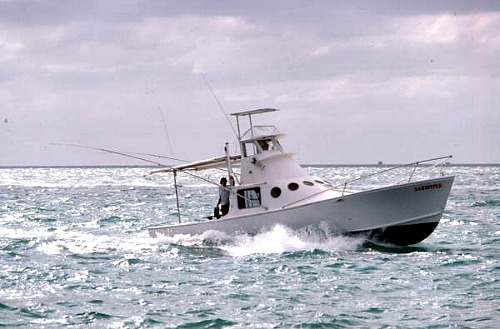 By clicking on the Get Rates Button you will then go to the individual landing pages for each of these Key West fishing charters and there you'll be able to determine current rates, where they go, how they fish, what they target, fishing trip availability, types of fishing gear used and boat specifications. Let's Go Offshore Keys Fishing! Going after marlin and sailfish is one of the most exciting offshore fishing charters Key West captains can provide. So let's spend a full day out on the open water fishing for marlin. Your captain knows where the best place to deep sea fish is. He's heading out into the gulfstream, which is off the reef. Depending on the time of year, he'll go 7 - 12 miles out, or as far as 20 - 25 miles. As the boat speeds across the water, the ocean begins to turn a deep blue purple. There's a little bit of wave action, and everyone on board is experiencing mother nature at her best. The ocean is full of sea turtles, dolphins, jelly fish, humpbacks and other whales, even an occasional 28 - 30' long whale shark. The sky and the ocean's surface is dotted with a variety of birds, including terns, frigate birds, seagulls, pelicans, and cormorants. The Captain's plan of attack is to go offshore of the outer reef where he'll look for sailfish, marlin, big dolphinfish, and wahoo. This is where the reef drops down and you can fish wrecks, debris, rubble piles, and other drop offs. Today you're heading out 18 - 20 miles to catch marlin, or whatever offshore fish hits the bait. 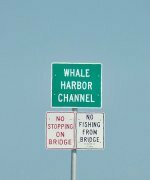 You'll be Keys fishing between 700 feet and 1500 feet deep with the wall, which is a continental shelf that drops off from about 800 feet to 1800 feet. This cliff, locally referred to as Wood's Wall, marks the beginning of the Straits of Florida which runs to Cuba. The wall is filled with different cracks, the Middle, East, and West Crack. Besides these cracks, there are holes, turns, rips and eddies, and these features help to congregate debris and bait which draw in the marlin. When Florida marlin fishing, your Captain will troll, pulling lures, ballyhoos, and ballyhoo-lure combos. Everyone's on red alert because the Captain has warned that nothing compares to the excitement of catching that first glimpse of the big dark, black shadow. He's advised everyone to watch their lure, so they'll be able to see the big marlin when he hits the bait. Marlin are incredibly fast, and can move from one side of the boat to the other in the blink of an eye. It's spellbinding to watch a marlin quickly move from lure to lure, plus when you raise them up off a teaser and over to bait, they're incredibly corrective and lightning fast. Marlin are also extremely aggressive, and you'll see that they frequently have their dorsal fin and tail out of the water. When they come racing after the bait, they'll even throw water like a rooster tail and when they hit, there will be a huge splash and explosion. 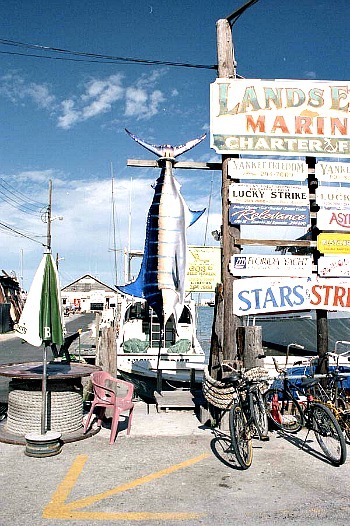 If you're going out charter fishing Key West is known for red hot fall, winter, and early spring action. This is when you're hooking 2, 3, 4, even 5 Key West fish at a time because they're traveling in schools. You can also hook different species simultaneously. Tuna, wahoo sailfish, kingfish, bonita, barracuda and even dolphin will occasionally hook up at the same time. When this happens the excitement is pulsating even for a pro. For someone who's never or rarely ever fished, it's an unforgettable experience. This is the time of year when deep sea fishing tuna is productive. They come into the area, and they make huge splashes when they hit the bait, and loud explosions when they jump out of the water. This is also when large schools of kingfish show up and you'll be hooking 2, 3, 4 at a time. 800 pound porpoises will often get into the mix, chasing down your fish and eating it right off your hook. When out on Key West sport fishing charters, fishing for wahoo is something else you'll want to do. The cooler months bring in the schools and you can catch 4, 5, even 6 at a time. Ranging from 30 - 60 pounds, these lightning fast fish shoot big rooster tails as they skyrocket the bait. Wahoos are the torpedoes of the sea and are the fastest fish in the ocean. Capable of reaching 70 mph, they have razor sharp teeth. They are a dark blue, with silver on the belly, and light blue "racing" stripes down their side. When you're fishing for wahoo, you're in the midst of a school of lightning fast frenzy. This Key West fish is also extremely hard to catch, not just because of their speed but because of their jaw. Not only does it move up and down, it wiggles side to side, making it possible for them to work the hook loose. Of course one of the best parts about Key West offshore fishing is that you never know what you'll catch. If you happen to hook one of the acrobatic species such as dolphinfish, sailfish, marlin, tuna, barracuda, or tarpon, you'll gain even more from the visual thrill. Grouper and amberjack are non-aerial fighters but they're still fun to catch. These are heavy fighting fish that pull downward like freight trains in their attempt to get back to their den. You can fish for them all year, but grouper fishing season is best when the water cools up on the reefs in late fall and early spring. On Key West fishing charters you can also sight fish or use live bait to go sailfishing inshore in about 100 - 200 feet of water. Florida Sailfish are one of the most acrobatic fish, and are especially fun to catch on light tackle. When you hook a Florida sailfish on a 20 pound spinner rod, and they go insane, jumping and spinning, you know you've hooked something special. People are sometimes scared about the prospect of going offshore fishing in Florida. Don't be. This is perhaps one of the greatest thrills you'll ever experience in your lifetime. 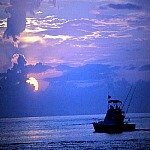 In keeping with Key West's fun and famously laid back atmosphere, party boat fishing charters are very popular. Opting for a party boat gives you a chance to go out for a half or full day with friends, or make new friends while fishing the open water. Key West party boat fishing makes your expedition more affordable, since there are more people or 'heads' on board. The party boat fishing charters supply all the necessary equipment and licenses just like regular charters do, and they fish the same water. Basically it all comes down to whether you're looking for more privacy and quality one-on-one time with the fishing Captain, or whether you'd rather be on a boat with a lot of people, and save some money. However, Florida Keys sport fishing charters are still the most popular and this is where you'll find the biggest action. The key to finding a good Key West fishing charter company though, is to make sure you ask the right questions. 1. Is the boat climate controlled? 2. What kind of speed does the boat have? 3. As a safety feature, does it have one engine or two? 4. What amenities and extras do I get? 5. How experienced is the crew? The Florida Keys is known for it's red hot fishing action and fast paced fishing tournaments. After you've spent a day or two deep sea fishing Key West for sailfish, or swordfish, you should plan on going out with any of the different Key West flats fishing guides. 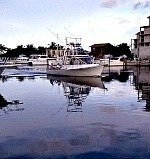 You'll find that qualified Key West fishing guides will help you take your sport to a totally new level as you enjoy the Key West back country. When Key West flat fishing you stalk and sight fish, seeking out tarpon, the wary permit, and skittish bonefish. Shark, barracuda and other fighters will also challenge your skill and strength once you have them hooked on your fly or lure. Key West Florida is also closely situated to the very popular Marquesas Atoll. 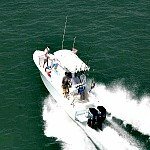 Less than 30 miles offshore, the Marquesas Keys are a popular destination guaranteed to provide many great memories and fishing tales you'll cherish and share. Key West fishing also includes overnight trips to the Dry Tortugas National Park. There are a number of Florida fishing restrictions in place when fishing Dry Tortugas, but this means the areas open to fishing are very productive.